In an area of suplemental irrigation, like the delta region of west central Mississippi, pivots are at their best when asked to perform in a variety of summer weather conditions. The summer of 2000 provided just such an opportunity. “We saw a renewed interest in center pivot irrigation after that summer. It was hot, dry and windy from early spring until late summer,” repor Mark and Don Barger of Big D. Inc., Greenwood, Mississippi. During the peak of the growing season, cotton needs 2 ” to 3 ” of water each week. When rain is scarce, precise timely irrigation is essential for top yields. Irrigate too late and the crop will mature later than it should, causing problems down the road like boll rot. 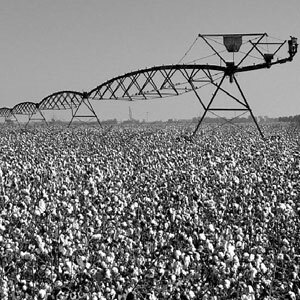 On average, center pivot irrigation will increase yearly cotton yields 200-300 lb./acre over dryland cotton, the Barger brothers report. This expected yield increase is often the result of maintaining good soil moisture after planting and throughout the growing season. Increased yields also depend on center pivot reliability and a well trained and well equipped irrigation dealer. “The one thing cotton farmers don’t want is an expensive bird rest. They want a reliable center pivot and the assurance that the irrigation dealership can quickly handle any concerns.” says Don Barger. Cotton is the main crop in the Mississippi Delta, but corn, soybeans and wheat also benefit from the timely application of irrigation water. That’s because pivots can deliver irrigation water quickly and in small amounts in the spring to get crops up out of the ground and to assist with the activation of pre- and post-emergent herbicides, something flood irrigation simply can’t do. Plus, some fields with hilly, rolling ground are simply better suited to center pivots. Growers aren’t faced with the expense of land leveling required with gravity flow irrigation, either. Mississippi growers put center pivots on dryland fields or convert flood irrigated fields to mechanized irrigation to reduce labor and to make the irrigation process easier to manage. And those may not even be the most important reasons for irrigating with center pivots. “The greatest advantage of pivot irrigation is the ability to get water to the crop quickly, when it will do the most good,” Mark explains. Cotton irrigation starts in the early spring with as little as 0.5″ of water applied soon after planting. This helps to encourage seed germination and to establish a uniform stand. Two and sometimes three applications of 0.5″ of water also helps activate crop chemicals. A wet year like 2002 is a once in a decade event with 1982 and 1991 the only other two in recent memory. Spring and summer growing conditions were ideal, with rain coming at just the right times. One response to "Cotton crop in the Mississippi Delta"
I completely agree that irrigating at the proper time is fundamental when water is scarce. You have to be sure that all the crops are being irrigated uniformly. Depending on how large the agricultural parcel is, a center Pivot is always the best way to achieve uniform irrigation.